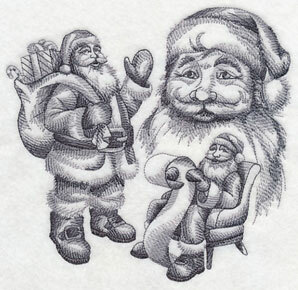 Christmas is coming, and new designs will add the spirit of the season to your gifts and decorations! 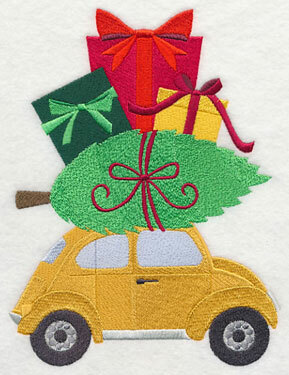 Colorful cars are loaded with trees, ornaments, and wrapped gifts. 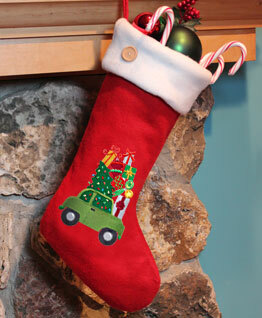 They will make wonderful additions to stockings (like the one shown left), tea towels, tree skirts, and pillows. 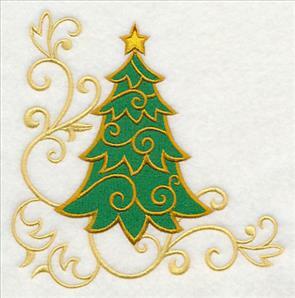 Christmas trees and ornaments in elegant filigree will bring sophistication and style to your table linens, scatter pillows, quilts, and wall hangings. These stylish designs make a dramatic effect with only a few color changes. 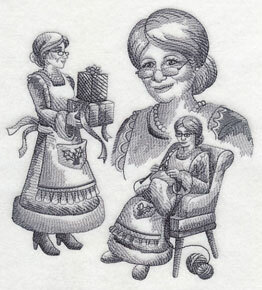 Scroll down the page, and enjoy the new designs! 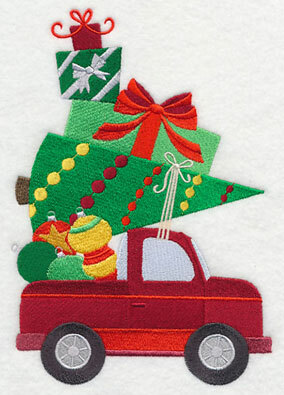 These little cars zoom merrily along, racing toward Christmas Day! They are filled to the brim with trees, ornaments, and wrapped gifts! 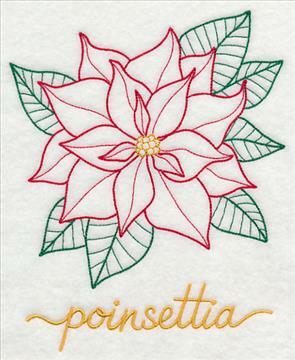 They're a nice shape for stockings, mini-quilts, wall hangings, and throw pillows. 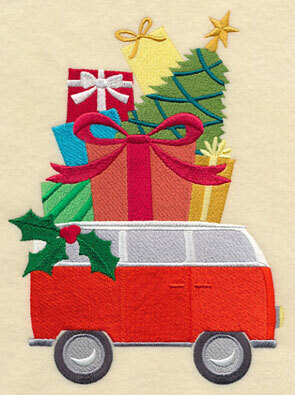 5.82" x 7.62" and 4.84" x 6.33"
A pickup truck and microbus are loaded with the colors of Christmas. 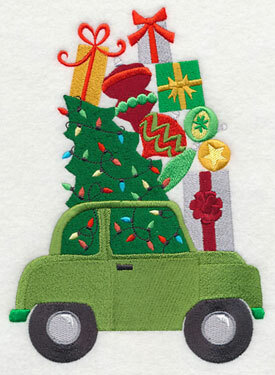 These designs add holiday charm to your gifts, and seasonal spirit to your home decor. 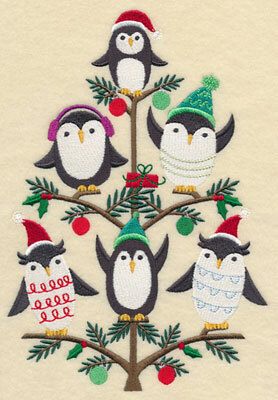 5.80" x 7.80" and 4.90" x 6.61"
These sweet little penguins are ready to bring Christmas cheer to your projects. Add them to fleece scarves and pullovers; arrange them in a trio on a sweatshirt front, or use them to dress up a set of towels for the bath. 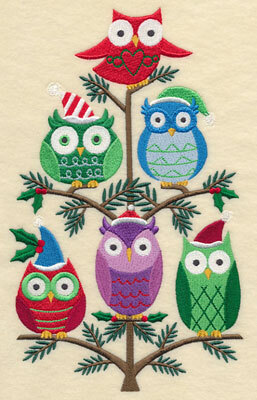 4.46" x 5.70" and 3.01" x 3.86"
Add a lively look to tea towels, stockings, pillows, and tree skirts with these designs! 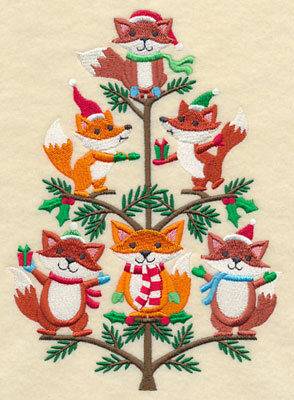 Fashionable foxes and wise owls gather in Christmas trees. 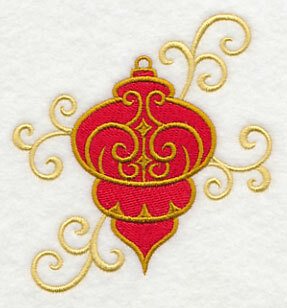 They'll add sweet and stylish charm to your embroidery projects! 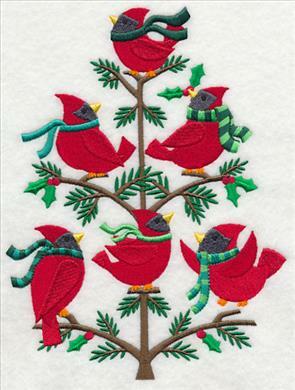 5.78" x 9.40" and 4.80" x 7.81" and 4.21" x 6.85"
Bright red cardinals wear green scarves as they pose in evergreen branches. 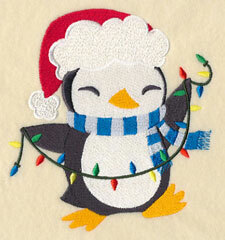 And, festive penguins add a holly-jolly holiday spirit to your home! 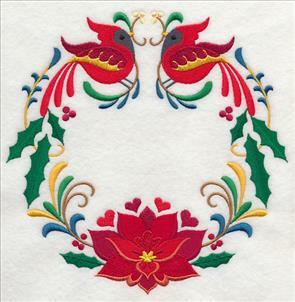 5.88" x 8.52" and 5.40" x 7.81" and 4.74" x 6.85"
and style is lovely on items like tea towels, pillows, and placemats. 7.80" x 7.66" and 7.04" x 6.91"
7.80" x 7.74" and 6.90" x 6.85"
5.86" x 5.81" and 4.86" x 4.82"
Bows, pine cones, hearts, and stylized flowers add festive flair to your Christmas projects. The graceful lines and elegant symmetry bring an eye-catching effect to garments and decor. 7.80" x 7.72" and 6.90" x 6.83"
7.80" x 7.64" and 7.03" x 6.89"
5.93" x 5.81" and 4.86" x 4.76"
Cheery cardinals and bright stars are the features of these wreaths. 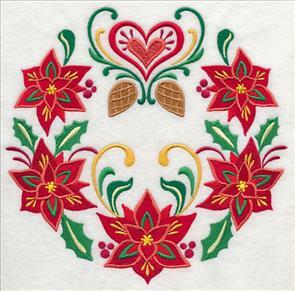 Inspired by the traditional Pennsylvania Dutch art form, these designs will add a cozy, country feeling to table linens, pillows, blankets, and table linens. 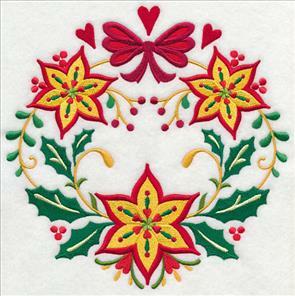 7.81" x 7.79" and 6.91" x 6.89"
7.81" x 7.80" and 6.90" x 6.90"
5.84" x 5.85" and 4.86" x 4.85"
Stitch sweet symmetry on your embroidery projects this holiday season! 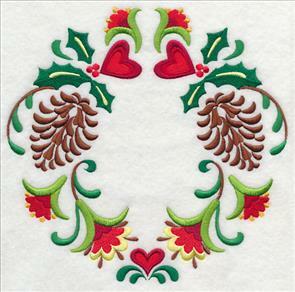 The wreaths can be ordered singly by clicking the links above. Or, buy all 6 in a design pack! 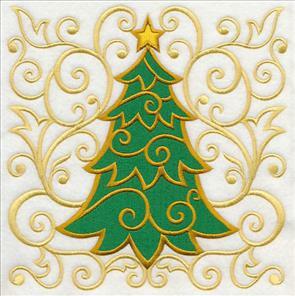 **XL - Designs smaller than 7.9" x 7.9"
**Lg - Designs smaller than 7" x 11.8"
**Md - Designs smaller than 6" x 10"
A Christmas tree is framed in graceful and elegant filigree. Simple colors, dramatic effect! The square shape is nice for pillows, quilt blocks, placemats, and towels. 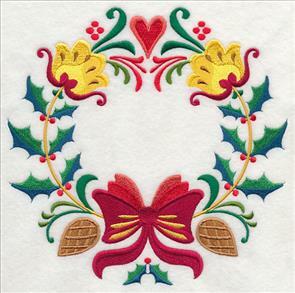 The spray is festive on the borders of wall hangings and table runners. 7.81" x 7.84" and 6.91" x 6.94"
5.86" x 5.88" and 4.85" x 4.87"
4.96" x 11.70" and 3.98" x 9.39"
3.31" x 7.81" and 2.91" x 6.86"
This border design features a tree, decorated with, and wrapped in, elegant filigree. Stylish and sophisticated on placemats, table runners, and tea towels. 11.70" x 4.94" and 9.41" x 3.98" and 7.81" x 3.31" and 6.00" x 2.62" and 3.85" x 2.27"
A coordinating corner and accent add seasonal sweetness to linen napkins, pockets, and bottle wraps! 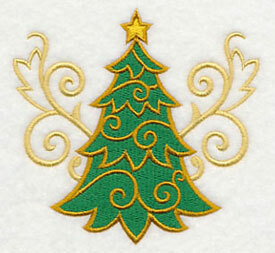 Gold filigree on an evergreen tree brings a merry and bright look to your home for the holidays. Order the designs singly by using the links above, or buy them in a pack! 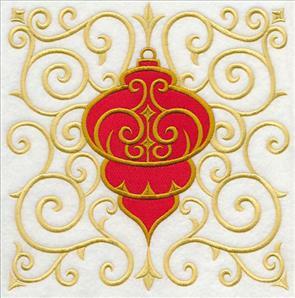 **XL - 9 designs smaller than 7.9" x 7.9"
**Lg - 9 designs smaller than 7" x 11.8"
**Md - 9 designs smaller than 6" x 10"
An antique ornament is made even more elegant when framed in gold filigree. 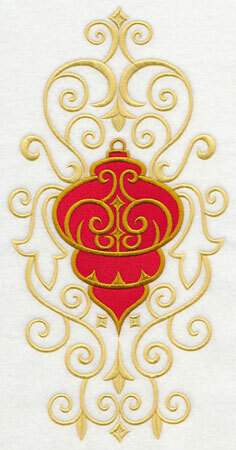 We chose red for the ornament, but it would look lovely in other hues, too! Try jewel tones of purple, emerald green, bright pink, and turquoise. 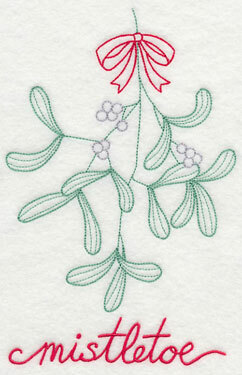 Try the filigree in silver, blue, and pine green, for dramatic effect. 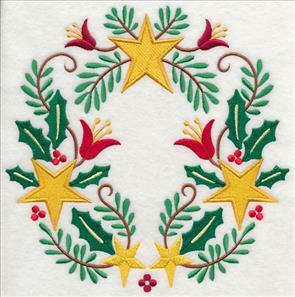 7.81" x 7.80" and 6.91" x 6.90"
6.00" x 11.74" and 4.81" x 9.41"
4.00" x 7.81" and 3.51" x 6.86"
Stitch this festive border on table runners, placemats, aprons, and tea towels, to add a bright and lively look! 11.70" x 4.87" and 9.41" x 3.92" and 7.79" x 3.25" and 5.98" x 2.62" and 3.86" x 2.25"
The corner and accessory are delightful on linen napkins, pockets of cardigans, corners of placemats, and tea towels! Let your creativity sparkle and shine with these designs! Order the designs individually by using the links above. Or, buy them in a design pack! 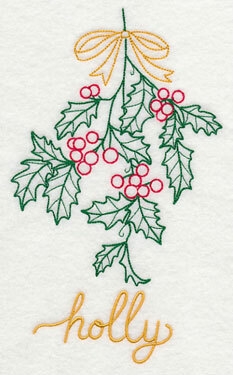 These quick-to-stitch Christmas designs add sleek style and sophistication to your projects - and they're lightning fast! 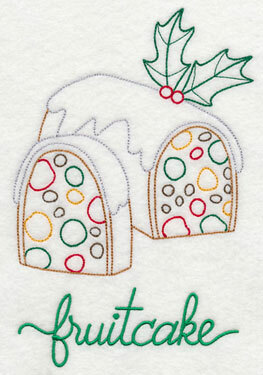 Make sets of holiday towels, and wrap in ribbons to give as gifts. 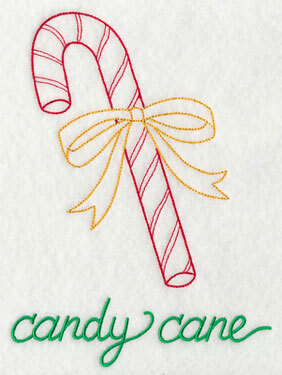 Mistletoe and candy canes make for sweet Christmas wishes and kisses! 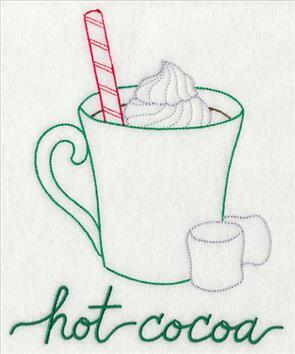 Add to placemats, tea towels, and quilt blocks, too. 5.42" x 7.41" and 4.50" x 6.15" and 2.83" x 3.87"
The text is on a separate color stop, so you can use it for some stitchouts, but delete it for others! 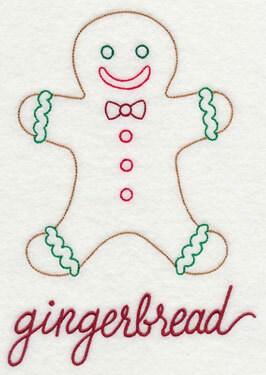 Gingerbread and hot cocoa will add delicious flavor to your holiday gifts and decor. 5.59" x 6.87" and 4.64" x 5.70" and 3.14" x 3.86"
Fruitcake - that classic Christmas pastry! 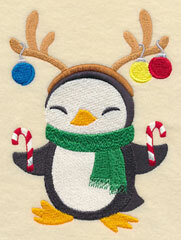 - is colorful and fun on tea towels, aprons, and gift bags. 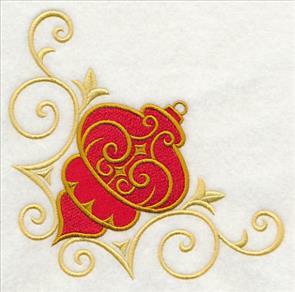 Seven quick-stitching designs are excellent for making kitchen towel sets. 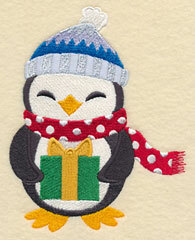 And, the designs are perfect for placemats and quilt blocks, too! Order them individually by clicking the links above. Or, buy them all in a design pack! 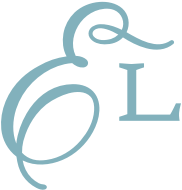 Sketch-style designs are light and open. The dramatic effect in the art is achieved by using three shades of color, along with varying densities of stitches. We've mainly featured animals and birds in the sketch medleys and collages. But Paulette asked us to try Santa, and Mrs. Claus. Oh what fun it was to create these designs! They're a perfect match for smooth, neutral fabrics, such as quilter's cotton, twill, linen, denim, and canvas. Thank you, Paulette, for the suggestion! 6.88" x 7.50" and 5.85" x 6.38" and 4.85" x 5.29"
The Request of the Week program is one where you can suggest a design for us to draw and digitize. It's a popular program, and designs are scheduled through 2015 and beyond. However, we still want to read your ideas. Send requests to support@emblibrary.com. We'll add them to the list of designs to be created!